Our team strives to help you reach better health, and we’re dedicated to continuing our education to bring you the most up-to-date health care. 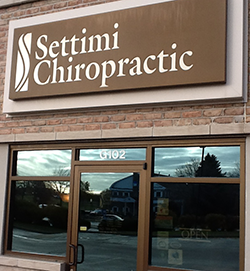 At Settimi Chiropractic & Wellness Center our mission is to offer gentle, affordable chiropractic care to everyone who seeks it. We realize the hazard that the vertebral subluxation causes in your quality of life. We believe everyone deserves a healthy life free of vertebral subluxation. We’re here to maximize the potential of every individual. We see a range of ages, from pediatrics to geriatrics. Sometimes you might mistake our waiting area for an obstetrics office because of all the expectant moms we see! We’ll help ensure your body is fine-tuned so you can function better at work, at home, and in living an active lifestyle without pain. Some patients have been with us for over 20 years. We consider all our patients to be a part of our family. We want you to take time out of your daily living to make sure you take care of yourself. When you’re at Settimi Chiropractic & Wellness Center, we make sure you’re comfortable, seen promptly and all your needs are addressed. Dr. Schultz is a great listener and spends time with you to answer all of your questions. From her years of experience, she’s able to help you figure out the cause of your health issues and how to best assist your particular concerns. Come in and relax while we get you a cup of tea. We want to bring fun and enjoyment to your visit with us.